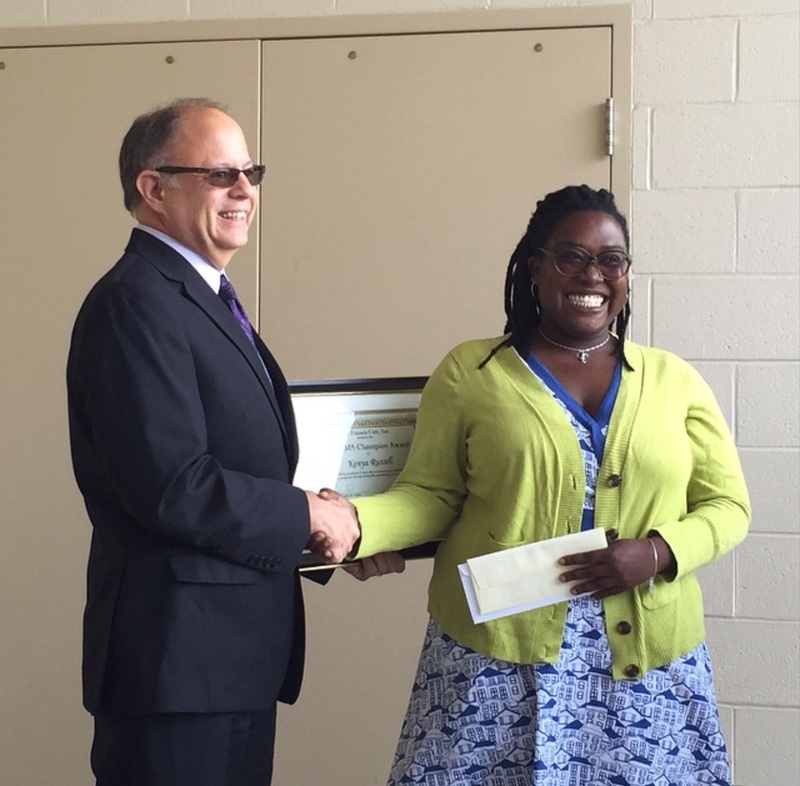 HARTFORD — On May 20, 2015, as part of EMS Week celebrations, ASM’s Kenya Russell received an EMS Champion Award from Saint Francis Hospital and Medical Center. The award was conveyed to Kenya and Vernon Fire Department’s Jean Gauthier by Saint Francis EMS Coordinator John Quinlavin and EMS Medical Director Dr. Steve Wolf. Click to Enlarge. (L to R): John Quinlavin, Kenya Russell, Jean Gauthier, Dr. Steve Wolf. I’d like to nominate my friend, co-worker Kenya Russell, paramedic at ASM. As a paramedic, she assesses each patient and treats them as the individual they are. She is very good at gaining a rapport, making them feel as comfortable as possible. With her amazing smile and contagious laugh, it is not uncommon to hear laughter as she cares for patients. Music is a great tool she uses and will offer to play whatever their favorite might be, even if not her favorite. I admire her strength, confidence, and ability to advocate for patients. She not only stands up for patients, she also stands up for herself earning respect from others. Kenya is continuously learning about EMS from CMEs and from her calls, and consulting with other providers to improve her knowledge and care. Kenya is not only an amazing paramedic on the clock, but she has traveled abroad to experience other cultures and assist in their healthcare. And if that wasn’t enough, Kenya organized a support system for a friend and co-worker, playing a major role in starting up the Carolyn Edwards Foundation to help Carolyn as well as continuing the support efforts for others EMSer’s in need. HARTFORD — During April 2015, ASM Paramedic Supervisor Matt Tuttle and his EMT partner, Supervisor Mike Sparks, responded to a medical call in South Windsor. 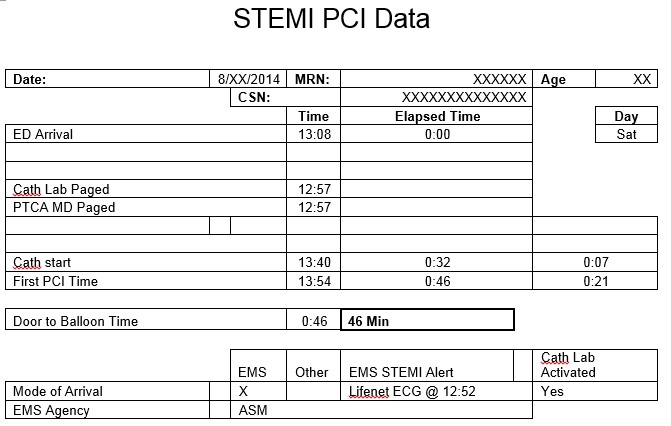 The EKG was indicative of a STEMI and Matt wirelessly transmitted the 12-lead EKG to Saint Francis Hospital, activating their cardiac catherization lab from the field. (#15-24713). Vessel Angiography Findings/Treatment: 100% thrombotic occlusion of Distal RCA; hypotensive, required Dopamine, ejection fraction 55%. Comments: onset 20 min PTA dispatched 0822; EKG transmitted on scene to ED & med control contacted prior to departure; left scene @ 0840 (South Windsor location)- in ED pt remained on EMS stretcher then to cath lab. 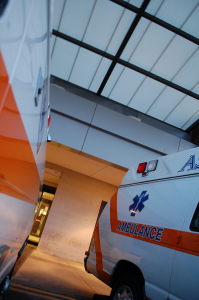 “An incredible job by EMS with efficient recognition, treatment and early notification. 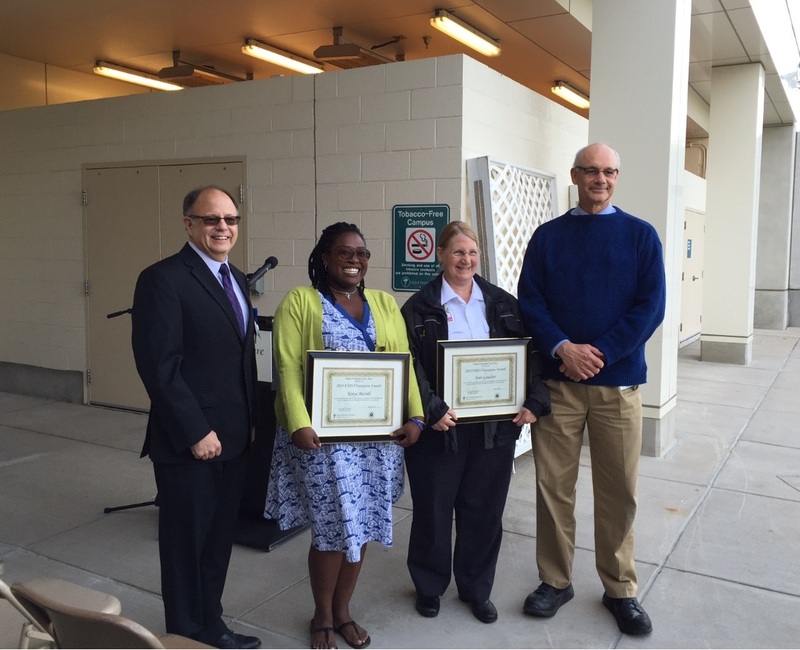 St Francis Hospital and Medical Center is excited about the partnership we have with the ASM and Aetna staff. We are grateful for the teamwork displayed toward improving care for our STEMI patients, as well as others.” – John Quinlavin, EMS Manager, Saint Francis Hospital and Medical Center. Comments: Cath showed 100% Mid RCA Lesion which was opened and stented. HARTFORD — During August 2014, Aetna Paramedic Matthew Carter and his partner Kathryn Stewart, wirelessly transmitted a 12-lead EKG to Saint Francis Hospital, activating their cardiac catherization lab from the field. “Another great job by your staff!! 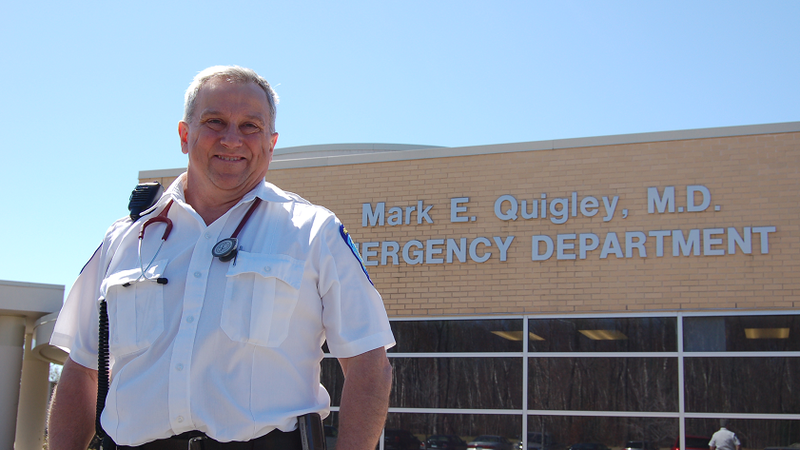 ” – John Quinlavin, EMS Manager, Saint Francis Hospital and Medical Center. Cath showed 100% LAD Lesion which was opened and stented. HARTFORD — During August 2014, ASM Paramedic Preceptor Dave White and his preceptee Paramedic Sean Norton, aboard Andover Fire Department ambulance, wirelessly transmitted a 12-lead EKG to Saint Francis Hospital, activating their cardiac catherization lab from the field. “What a great job with notification and communication by your medic! He called early (19:08) to have a conversation with MD regarding an unclear EKG and provided additional information on subsequent patches. I was very impressed with his professionalism and clinical skill. Early notification and a very well presented paramedic report to the MD allowed for early activation of our cath team by 13-18 minutes.” – John Quinlavin, EMS Manager, Saint Francis Hospital and Medical Center. 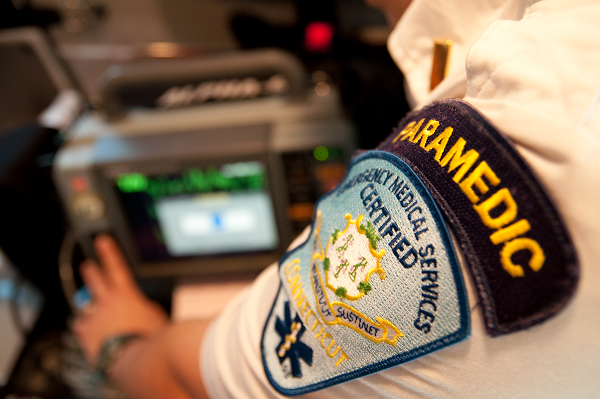 MANCHESTER — On August 7, 2013, six EMTs were added to the ASM team. As part of our continued growth ASM and Aetna seek out only the best candidates. We look for employees who are focused on high-quality patient care, are team oriented and conduct themselves in a professional manner. During the orientation, employees learn about company philosophy and goals, quality assurance, and policies and procedures. Jonathan Bush: FULL TIME, EMT. My name is Jonathan Bush I am 29 years old from Vernon, CT. I was born and raised near West Palm Beach, FL and moved to Connecticut when I was 16 years old with my family. I just graduated from Capital Community College in Hartford with an A.A. in Fire Science and EMS which is where I received my EMT training. I have also been a volunteer firefighter in the Town of Vernon for over ten years where I have gained experience with emergency response calls and made a lot of great friends. I am getting married soon and cannot wait to start our new life together. In my free time I am an avid runner and love to hike, mountain bike, kayak, and in the winter snowboard. I like to relax by watch movies, going to lakes and beaches, and hang out with family and friends. I am excited to start my career with ASM and look forward to all the new experiences I will have and meeting the all of the ASM team members. Sean Gregg: FULL TIME, EMT. My name is Sean Gregg and I am 23. I am from Plainville CT, and I graduated from Plainville High School in 2008. I am currently residing in Avon, CT and am actively seeking to relocate to Manchester for a shorter commute. My home life consists of my fiancé and two dogs Foxy and Mini who are a Japanese breed called Shiba Inu. I have spent the last four years of my life as a Cardiac Monitor Tech at Saint Francis Hospital and Medical Center. My hobbies consist of cars, and street bikes. I also like to stay up to date with the latest technology and I’m a Green Bay Packers fan. I have successfully completed an EMT-B course at Bristol Hospital in May of 2013. This is the first step of my career, and I am honored to have the opportunity to work for such a great company as ASM, and look forward to furthering my career and education with them. I dedicate my EMS career to my best friend who died last year in a motorcycle accident. 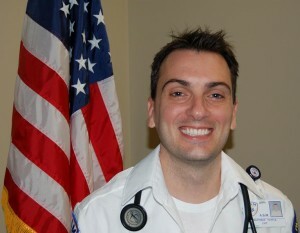 As for my EMS career with ASM I hope to gain much knowledge and experience so I can go back to school to be a Paramedic. Jared Krajewski: FULL TIME, EMT. My name is Jared Krajewski. In 2010 I joined the Bolton Volunteer Fire Department to give back to my town. They offered me training as an EMR where my interest in the medical field sprouted. Less than one year after becoming an EMR I obtained my EMT-B. As I am just passing the two year mark as an EMT, I am preparing to pursue a career as a paramedic and will be starting classes shortly. I have spent the past year and a half working in the Intensive Care Unit in Manchester Memorial Hospital and this experience has enabled me to understand patient care in the EMS scene and hospital setting. In the past I was a brick mason/crew leader for my father’s landscaping company and created a portfolio of work that I am proud to show off. I try to be very active and involved person with every aspect of my life including my vast list of hobbies such as shooting, mountain biking, diesel trucks, RC cars, hiking, and fishing. My free time could not all be spent without my three year old German Shepherd Fathom. He will go almost anywhere I go that dogs are legally allowed. I’m looking forward to being part of ASM and furthering my EMS career. Lauren Mazzoni: FULL TIME, EMT. My name is Lauren Mazzoni. I am 20 years old and live in Manchester, CT. I’ve volunteered at the fire department for the past three years handling mostly EMS calls. I am a newly certified EMT and live at the fire department full time. As a night crew member I am able to get a lot of experience. I am very excited to start my career at ASM and gain even more experience. Aside from volunteering at the fire department, I am taking classes at Central Connecticut State University for my criminology degree, which I started with plans to become a police officer. During my free time I like going to races at Stafford Motor Speedway, watch NASCAR every Sunday, fish, hike, and play sports. Since I was five and all throughout high school I have played sports, and it’s always been something I enjoy doing. 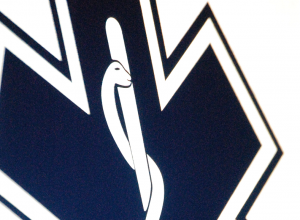 I am open to new and exciting things and while I am not sure what exactly how far I would like to go in my EMS, I am looking forward to gaining as much experience as possible at ASM. Evan Vaughn: FULL TIME, EMT. My name is Evan Phillip Vaughn and I am 34 years old. I live in Coventry with my wife and daughter and have been an EMT for seven years. I was born in Florida and raised in Texas. I started with the El Paso Fire Department and worked there for three years. I then moved to Connecticut and worked for another commercial service in the state for about two years. Eventually I would like to become a paramedic. I spend most of my time with my little girl outside in the woods. I enjoy cooking, fishing, hunting and just being outside. I am very happy to be a new employee of ASM and I look forward to meeting and working with all of you. Andrew Wysocki: FULL TIME, EMT. My name is Andrew Wysocki and I am 27 years old from Marlborough, CT. I graduated from Eastern Connecticut State University with a bachelors in business finance and a minor in psychology. It wasn’t long after college that I realized that being behind a desk wasn’t for me; I wanted to pursue something a little more hands-on. Spending a number in the years in the restaurant business I found that my people skills were my strength. A recent job working with the mentally disabled was an eye-opening experience for me and a good introduction to the health field. I learned a lot about myself during this time and definitely was put to the test in many different situations. The experience convinced me that “a life living for others is a life worth living”, as well as a fulfilling one. Now as an EMT I intend on continuing my service to the community in a different way. I hope this is the first step in continuing my education in the emergency medical field. 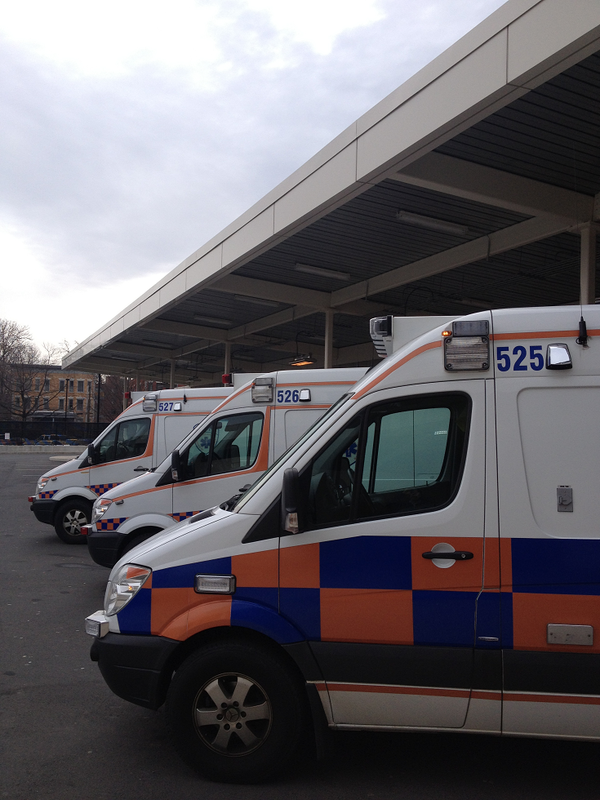 HARTFORD — Given the current size of the fleets, it is statistically unlikely that three ASM or Aetna ambulances would be seen in sequence anywhere outside of one of the main offices. This picture was taken outside of Saint Francis Hospital’s emergency department in March 2013. Here is an excerpt from Beth’s note: “Don has become an integral part of the JMH ED family! Everyone throughout the hospital knows Don and even where “Don’s desk” is located in the ED. He is even a stop on every ED tour! Don is the epitome of selfless hard work and team spirit. He is always willing to help out. He is friendly, courteous and compassionate with all patients and will assist patients and visitors as appropriate. 0700: Hartford Hospital EMS Room: Fresh fruit available. 1100-1400: Windham Hospital EMS, Open House and BBQ. 1200-1600: First Responders Appreciation Picnic and Media Day, West Hartford Town Hall, 50 South Main Street, West Hartford. 1500: Hartford Hospital EMS Room: Fresh fruit available. 2300: Hartford Hospital EMS Room: Fresh fruit available. 0800: Morning Coffee and Breakfast Treats at Manchester Memorial and Rockville General Hospital EMS Rooms. 0800-1400: Hartford Hospital (Conklin Building) 3rd Annual STEMI Conference, Lunch to be served. 1000: CT EMS Council Awards Ceremony, Legislative Office Building Room 1D, space is limited. 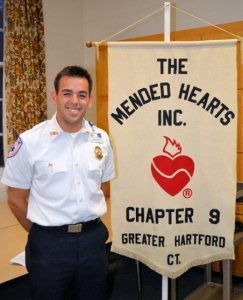 HARTFORD — On March 21st, ASM Paramedic Supervisor Vinnie Maston presented to the Greater Hartford Chapter of “Mended Hearts”. The chapter requested an speaker from the EMS community to present examples of the cutting edge technology presently in use in the field. 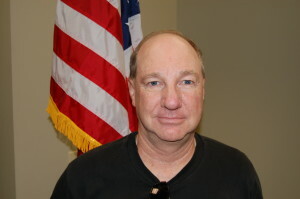 MANCHESTER — Congratulations to ASM’s Rob Bilodeau and Bob Anderson. Nice work! “It’s hard to believe that a year has passed since my family called 911 around 3 am on the morning of February 21, 2011 because I was having difficulty breathing. Help arrived quickly, with little fuss, and I was soon on my way to Saint Francis Hospital during the beginning of yet another snowstorm.